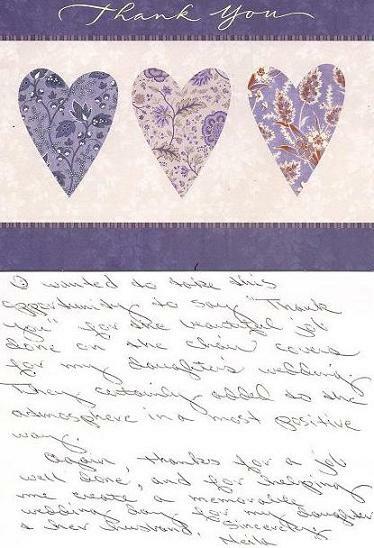 Below you will find just some of the many thank you cards and letters we have received from Chair Covers by Sylwia customers. From elegant Table Linens to Designer Chair Cover Fabrics, we do our absolute best to make every wedding or event in the Chicago metropolitan area truly unforgettable. This company is my 'go to' chair cover, chair rentals and linen company. 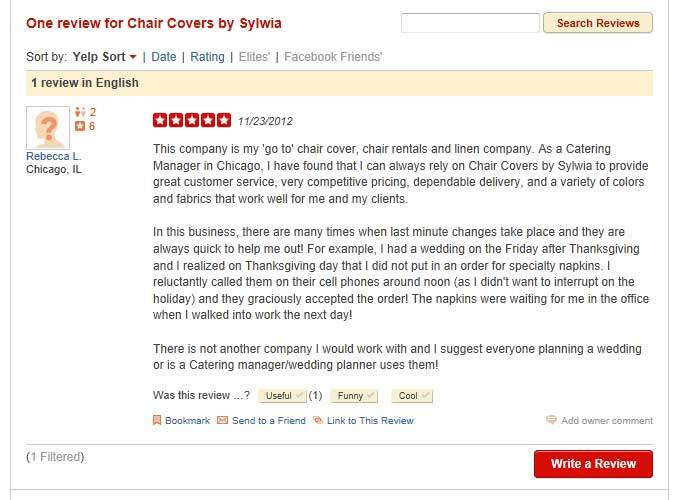 As a Catering Manager in Chicago, I have found that I can always rely on Chair Covers by Sylwia to provide great customer service, very competitive pricing, dependable delivery, and a variety of colors and fabrics that work well for me and my clients. In this business, there are many times when last minute changes take place and they are always quick to help me out! For example, I had a wedding on the Friday after Thanksgiving and I realized on Thanksgiving day that I did not put in an order for specialty napkins. I reluctantly called them on their cell phones around noon (as I didn't want to interrupt on the holiday) and they graciously accepted the order! The napkins were waiting for me in the office when I walked into work the next day! There is not another company I would work with and I suggest everyone planning a wedding or is a Catering manager/wedding planner uses them! 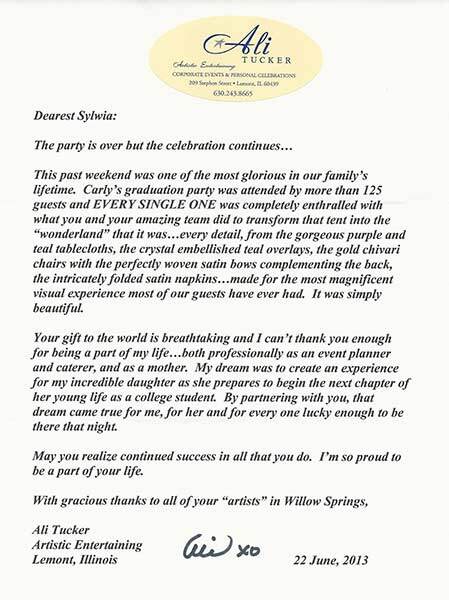 Dearest Sylwia:â€¦Graduation party was attended by more than 125 guests and EVERY SINGLE ONE was completely enthralled with what you and your amazing team did to transform that tent into the â€œwonderlandâ€ that it wasâ€¦ every detail, form the gorgeous purple and teal tablecloths, the crystal embellished teal overlays, the gold chiavari chairs with the perfectly woven satin bows complementing the back, the intricately folded satin napkinsâ€¦ made for the most magnificent visual experience most of our guests have ever had. It was simply beautiful. Your gift to the world is breathtaking â€¦.May you realize continued success in all that you do. With gracious thanks to all of your â€œartistsâ€ in Willow Springs. Thank you for donating the linens for Fr. Artur Slowaâ€™s installation reception. It was very generous of you. I also want to thank you for the exceptional service â€¦I ordered the wrong size linen for our round tables. When I noticed, I called your store immediately and explained my dilemma. Within 2 hours I had the correct size linens. I was very impressed! You did the chair covers & napkins for our wedding at Silver Lakes Country Club on May 20th, 2011. They looked amazing! 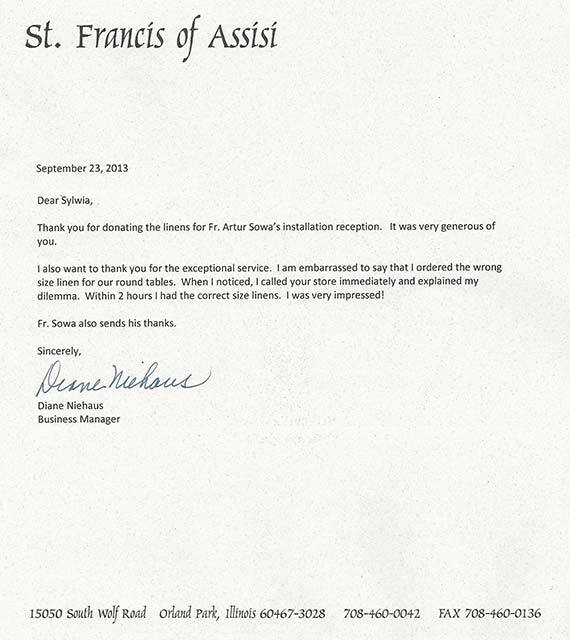 You did an outstanding job & made our reception look beautiful! Your prices were affordable & and the staff was a pleasure to work with. I would highly recommend your company for any event. You guys were awesome! Thank you for making our day look amazing! Warm Regards, Jillian & Jonathan. Thank you so much for your planning & design expertise â€“ you made our banquet room look beautiful without being overdone! Your service was seamless & everything you promised a stress free experience! Please enjoy the pictures & use any you would like for your business. Thank Again! Paul & Lisa. Thank you so much for your beautiful work on our tables and chairs. You guys were very helpful and patient with us and your good eye for recommendations when we may have gone overboard turned out to be perfect. Thank you for all you did and for such beautiful work. Thank you, Kim & Casey. We want to thank you so much for all of the hard work you put into our daughterâ€™s wedding. The room was just beautiful. The fact that you actually had all of those table cloths made was so much more than we ever expected! We received so many compliments on how lovely the room looked. We have given your name to a number of people and we hope you will hear from some of them. 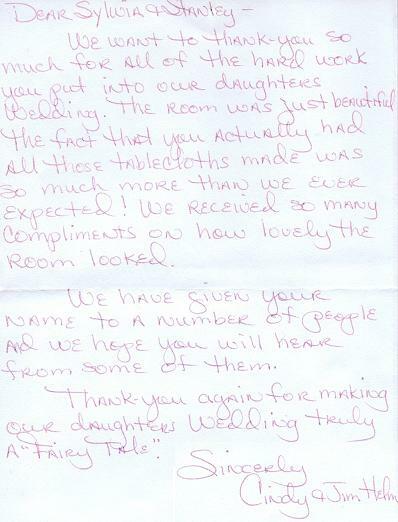 Thank you again for making our daughterâ€™s wedding truly a â€œFairy Taleâ€. Sincerely, Jim & Cindy. Thank you very much for making our wedding reception gorgeous! Everything looked classy and spectacular due to your beautiful table linens. I really enjoyed walking into the room and received many compliments. We also want to thank you for all your time and help with selecting what was best for us. We would recommend you to anyone. Love, Jen & Sean. 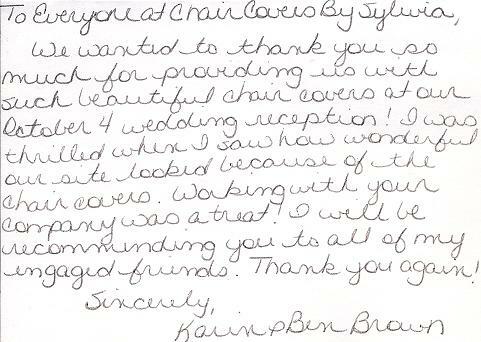 We wanted to thank you so much for providing us with such beautiful chair covers at our October 4th wedding reception! 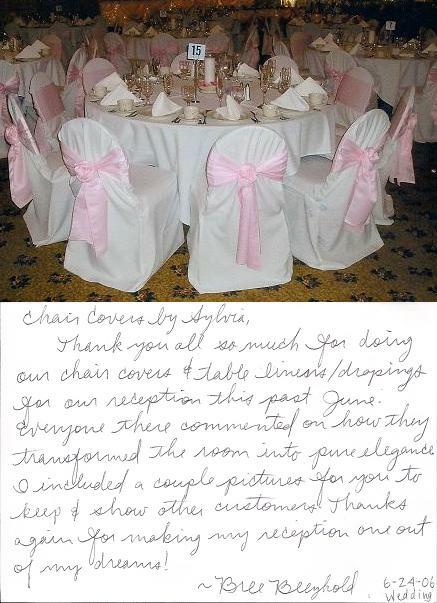 I was thrilled when I saw how wonderful out site looked because of the chair covers. Working with your company was a treat! I will be recommending you to all of my engaged friends. Thank you again! Sincerely Karin & Ben. 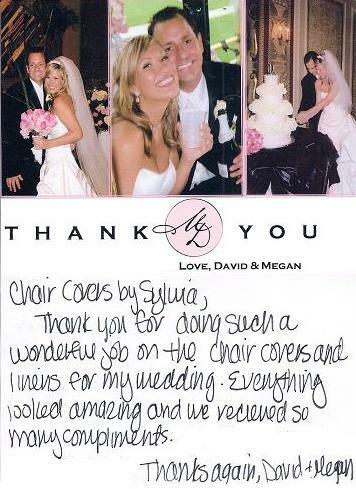 Thank you so much for providing the chair covers for my daughterâ€™s wedding. They were so beautiful. The room looked like a fairyland-what I always dreamed my daughterâ€™s wedding reception would look like. Your professionalism and personal touch added so much to the day. I will forward your name. Sincerely, Mary Jane. 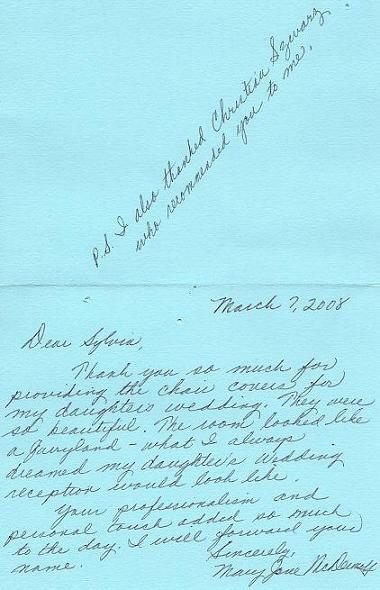 P.S I also thanked Christine who recommended you to me. 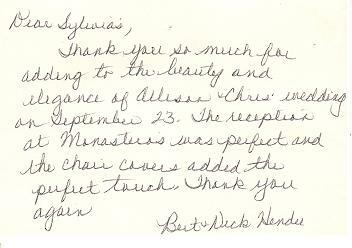 Thank you for doing such a wonderful job on the chair covers and linens for my wedding. Everything looked amazing and we received so many compliments. Thanks again, David & Megan. Thank you so very much for making our wedding a fairytale. 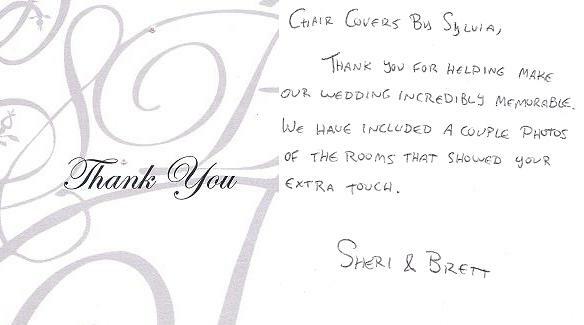 Your chair covers and linens added the special touch. Everyone was surprised how beautiful it looked. Once again, THANK YOU. Pani Sylwio, dziekujemy za wszystko! Wygladalo cudownie! Sylwia, thank you for everything! It looked amazing! 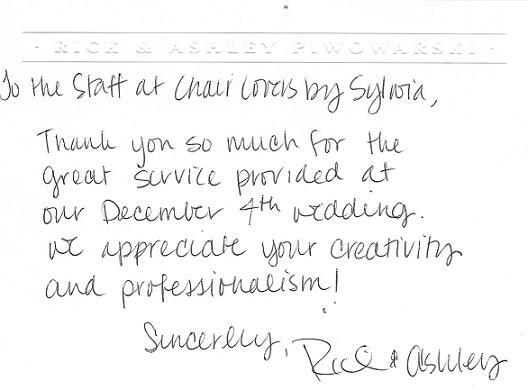 Thank you so much for the great service provided at our December 4th Wedding. We appreciate your creativity and professionalism! Sincerely, Rick & Ashley. 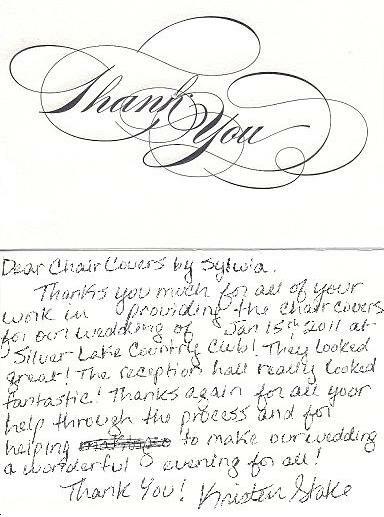 Thank you so much for all of your work in providing the chair covers for our wedding on Jan 15th, 2011 at Silver Lake Country Club! They looked great! The reception hall really looked fantastic! Thanks again for all your help through the process and for helping to make our wedding a wonderful evening for all! Thank you! Kristen S.
Words cannot explain how lovely the room looked for our reception. The chair covers & colored sashes were gorgeous. We had Fuchsia & Burnt Orange. 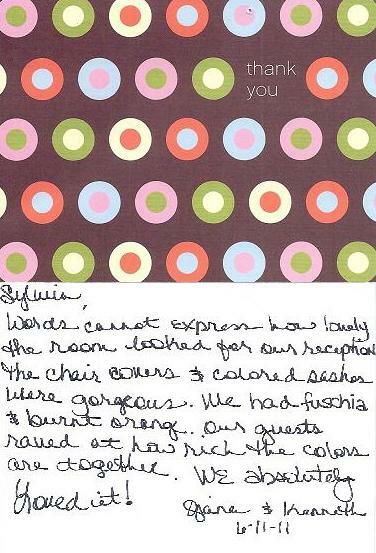 Our guests raved at how rich the colors went together. We absolutely loved it! Giana & Kenneth. 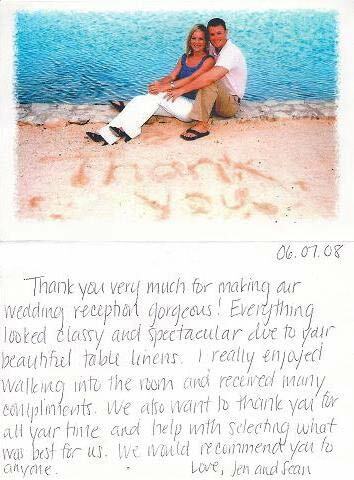 We really liked the linens and chair covers you and your company prepared for us on our wedding days! They looked beautiful! 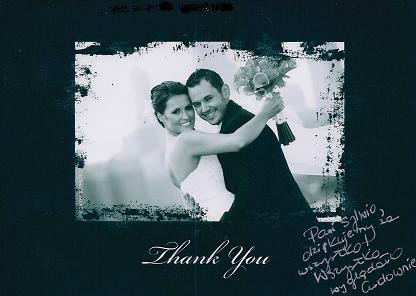 Thank you so much for helping make our day more special at Hotel 71 on June 26, 2010. Thank you! Jin & Virginia. Iâ€™m so sorry this is so late, I just want to thank you so much for the beautiful job you did at our wedding. Those chair covers turned out so gorgeous. Steve and I couldnâ€™t believe how stunning the room looked. 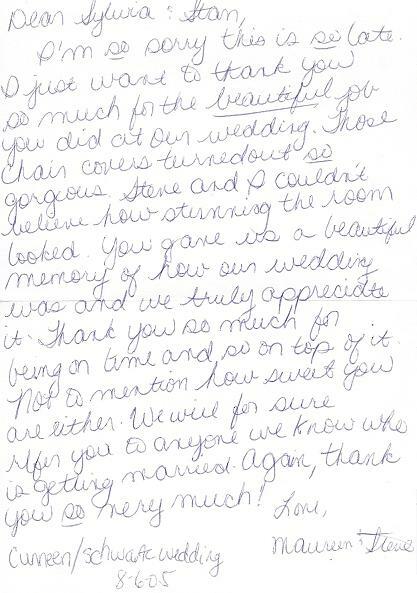 You gave us a beautiful memory of how our wedding was and we truly appreciated it. Thank you so much for being on time and so on top of it. Not to mention how sweet you are either. We will for sure refer you to anyone we know who is getting married. Again, thank you so very much. Love Maureen & Steve. 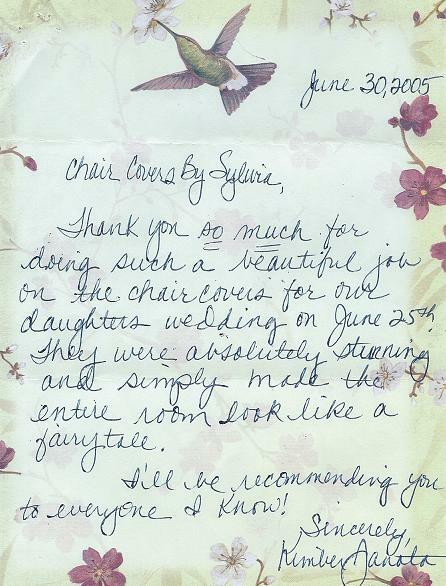 Thank you so much for doing such a beautiful job on the chair covers for our daughterâ€™s wedding on June 25th. They were absolutely stunning and simply made the entire room look like a fairytale. Iâ€™ll be recommending you to everyone I know. Sincerely, Kimber J. 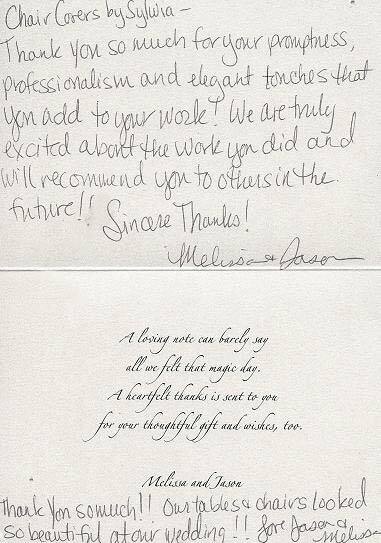 A note of thank to you for all you have done for my clients this year. 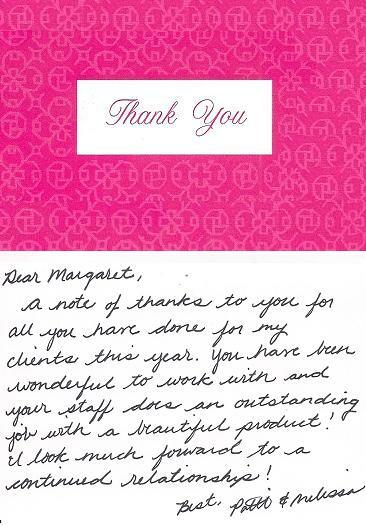 You have been wonderful to work with and your staff does an outstanding job with a beautiful product! I look much forward to a continued relationship. Best, Patti & Melissa. THANK YOU FOR GETTING THE SASHES TO US ON SUNDAY. YOU AND YOUR TEAM ARE AWESOME!!!! â€“ THE STAFF AT THE PATRICK HALEY MANSION. 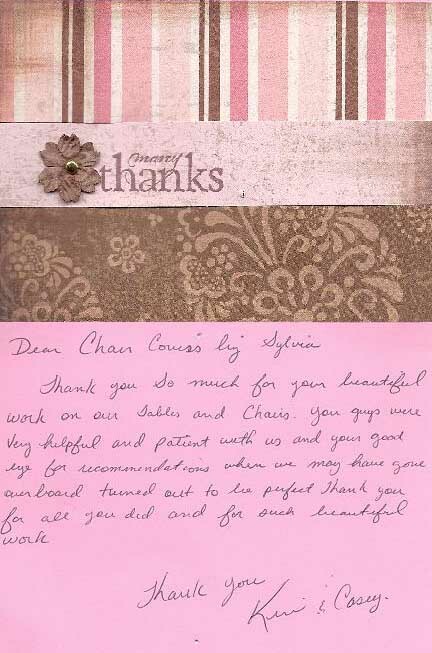 Thank you so much for adding to the beauty and elegance of Allison & Chrisâ€™ wedding on September 23. The reception at Monasteros was perfect and the chair covers added the perfect touch. Thank you again. Thank you for helping make our wedding incredibly memorable. We have included a couple photos of the rooms that showed your extra touch. Sheri & Brett. It was a pleasure to work with you on the September 5th wedding. 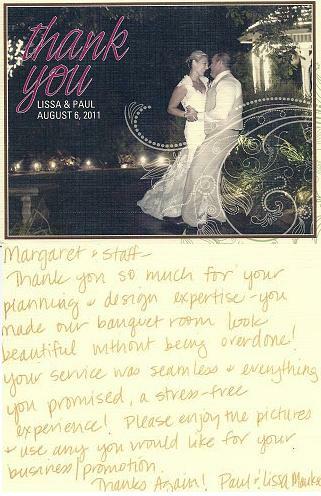 The linens were so stunning, and I know I can always count on your staff to do a great job. Thanks again and I hope we the chance to work together again soon! -Charlene. Thank you for helping to make our day one we will cherish forever. 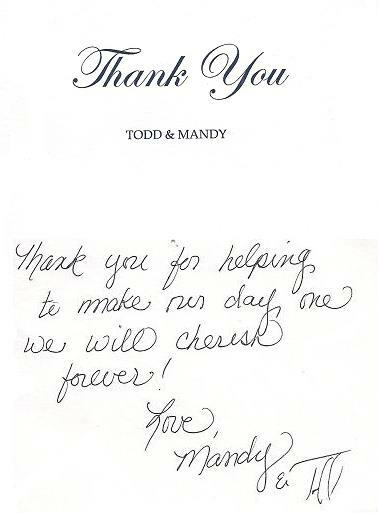 Love, Mandy& Todd. Thank you very much for the beautiful tablecloths. 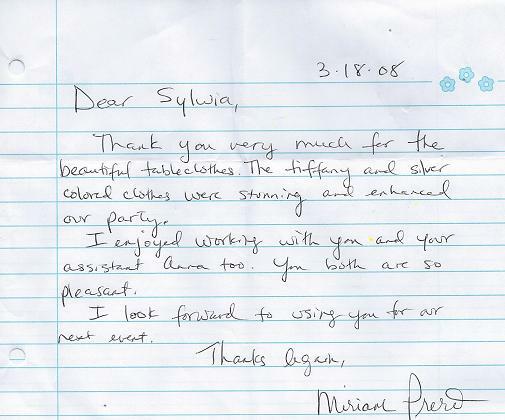 The tiffany blue and silver colored cloths were stunning and enhanced our party. I enjoyed working with you and your assistant too. You both are so pleasant. I look forward to using you for our next event. Thanks again, Miriam P.
Thank you very much for everything. Our reception was so beautiful with the covers & table linens. Lots of compliments! Thank you again for everything! Karen & Keith. I wanted to take this opportunity to say â€œthank youâ€, for the beautiful job done on the chair covers for my daughterâ€™s wedding. They certainly added to the atmosphere in a most positive way. 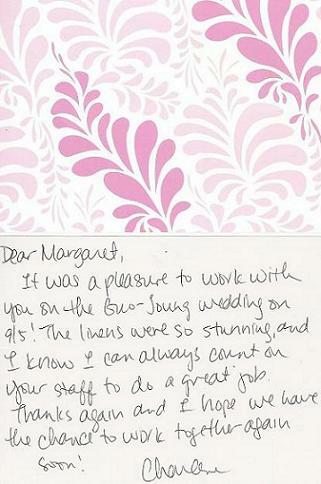 Again, thanks for a job well done, and for helping me create a memorable wedding day for my daughter and her husband. Sincerely Neila. Thank you for taking time out of your busy schedule to attend out Dinner on Patio. We all enjoyed planning it. 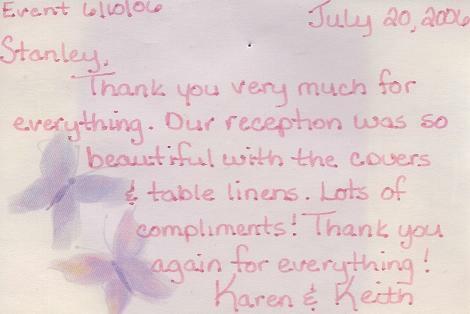 The patio looked stunning â€“ all because of your linens. 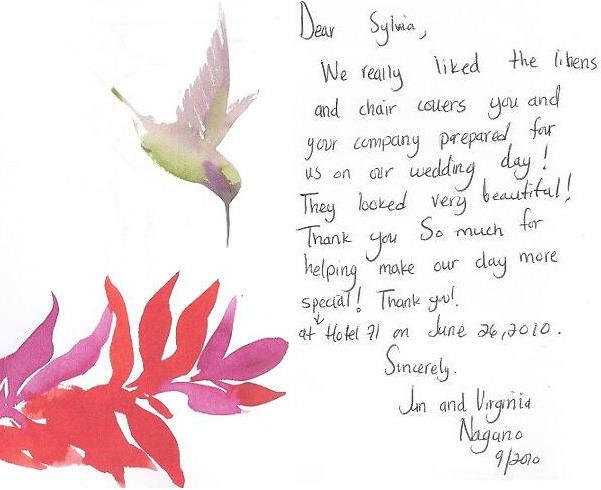 Thank you so much for supplying them & we truly appreciate the fantastic service that you give us. 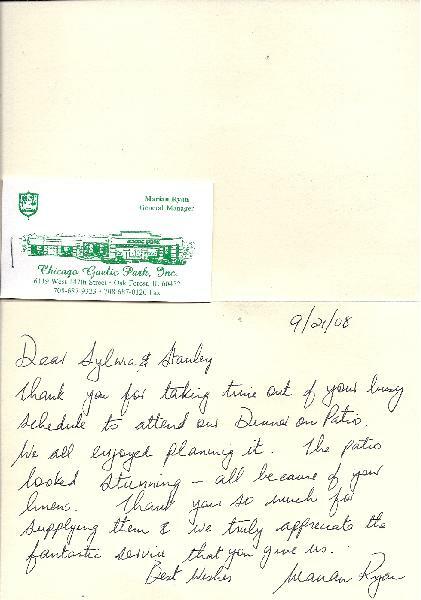 Best Wishes, Marian R. â€“ Chicago Gaelic Park General Manager.